First diagnosed by psychiatrist Leo Kanner in 1943, Autism has exploded into the public consciousness in recent years. From science to science fiction, academia to popular culture, Autism has captured the world’s attention and imagination. Autism has also ignited a fierce debate among stakeholders who seek to define its essence. Many parents of Autistic children regard Autism as a scourge and press for a cure. The Neurodiversity Movement, comprised mostly of Autistic adults, regards Autism as a different way of being worthy of respect and even celebration. The Autism war is well underway and, given Autism’s swelling ranks and proposed changes to the American Psychiatric Association’s Diagnostic and Statistical Manual in 2013, this war shows no signs of abating. Notwithstanding its rise to prominence in recent years as something both terrifying and terrific, Autism remains understudied in legal scholarship. This Article situates the Autism war within the larger theoretical debate over the social construction of disability and impairment.  This Article accepts the “social model” of disability’s claim that disability is socially constructed and rejects the “medical model” as a theoretical model altogether. But “disability” – socially constructed or not – does not explain the Autism war. “Impairment” is where the action is. This Article argues that while impairments like Autism may refer to some biological pathology, they are in part socially constructed. Autism is constructed not just by medical researchers and clinicians who name and diagnose it, but also by those who are so named – Autistic people, themselves, many of whom define Autism as a different way of being. Autism may be both a (still unknown) biological pathology and, according to Autism’s “Neurodiversity Movement,” an experience. Autism has implications for disability rights law. The 2008 amendments to the ADA make clear that people discriminated against based on Autism are protected under the law. But the ADA’s exclusion of Gender Identity Disorder continues. Coverage of Autism, on the one hand, and exclusion of GID, on the other, is untenable. Both are largely a mystery to science, exist along a broad spectrum, and count among their ranks people who see their nonconformity as something to be proud of, not pathologized. 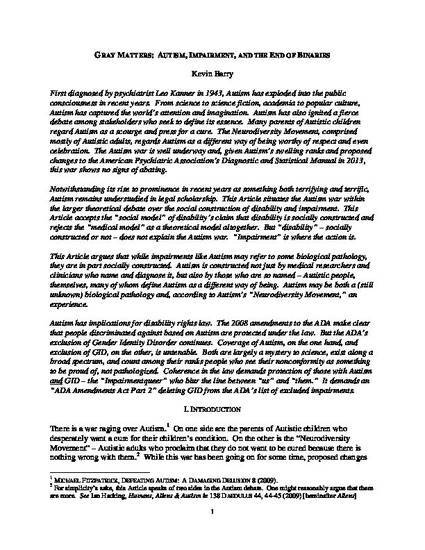 Coherence in the law demands protection of those with Autism and GID – the “Impairmentqueer” who blur the line between “us” and “them.” It demands an “ADA Amendments Act Part 2” deleting GID from the ADA’s list of excluded impairments.